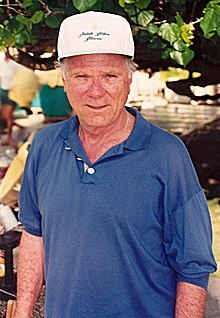 Jackie Cooper (September 15, 1922 – May 3, 2011) was an American actor, television director and producer. He started working as a child actor. He died in a Beverly Hills Hospital after a sudden illness. He was born in Los Angeles in 1922 as John Cooper, Jr. As a child, he appeared in the Our Gang television series as "Skippy". In 1931, at the age of nine, he was nominated for a "Best Actor" Academy Award. He became the youngest actor ever nominated for Best Actor. He was best known later in life as the Daily Planet editor Perry White in the Superman movies of the 1970s and 80s. ↑ 1.0 1.1 Spearman, Tony (2011-05-05). ""Our Gang" Star Jackie Cooper Dies at Age 88". myfoxdc.com. Fox Television Stations, Inc. Retrieved 2011-05-05. ↑ Kenneally, Tim (2011-05-04). "Former child star Jackie Cooper dies at 88". movies.msn.com. Microsoft. Retrieved 2011-05-05. Wikimedia Commons has media related to Jackie Cooper. This page was last changed on 5 February 2015, at 14:17.